This was to be my last great Czech track bash. PR and I had been working our way fairly methodically round the system and we’d got the remaining track down to the area of South West Bohemia bounded by a line Domažlice-Plzeň-Zdice-Praha-Tábor-Summerau. We’d done slightly different bits within the ‘target’ area but basically it could all be done in 6 days – if the engineers let us. As the engineering notices appeared on the ČD web site during the preceding days we had to adjust the plan but up until the afternoon before we left it all held together. Then the Curse of the Moleworks struck for a final time, with the České Budějovice to Černý Kříž line out of action from 3rd to 1710 on 8th, which ruled PR out. As luck would have it BMIbaby had cancelled my flight on the 8th, forcing me to stay an extra day which gave me a chance to finish the job. Theory was, this was to be the last great Czech bash. That was before yesterday’s moleworks update. Anyway, off to Irrational on London Midland’s 170 and Arriva’s stinky Voyager, arriving to find a huge queue at BMIb’s checkin. Fortunately I’d circumvented this by checking in on line so it was off for the usual boring wait (1.5 hours having been allowed for train cancellations which didn’t happen). Arrival at PRG was in sufficient time for a gentle wander to hl.n. via 119/A/C. I purchased PR’s and my tickets and a bagful of beer before joining 363125 and PR on 1511 to Tábor. Despite extensive moleworks (which have been going on for years so presumably the timings allow for them) we were on time at Tábor, allowing us adequate time to go and find 113001 on the Bechyně train, which goes from a single platform in the road outside the station. By ČD standards a loco and two open (well, a second open and an open brake second) coaches was quite civilised provision for a 50 minute late afternoon trundle. The sun obliged us at the end for a shot from the high viaduct just before Bechyně, and a nice shot of the loco once it had run round. On to České Budějovice on a strange and wonderful Praha-Salzburg ‘R’ largely composed of Italian stock and including sleepers – this on a train which ostensibly reaches its destination before midnight. In fact it’s renumbered at Salzburg and continues to Zürich and Venezia. Hotel Amstel was located easily enough, but didn't prove a good choice. Arrived bright eyed and bushy tailed [an unusually inaccurate observation] for breakfast at 0800 to find nobody present; laundry man and chambermaid were locked out and I had to let them in. The main man arrived eventually and we managed to get some breakfast before heading for the 0900 bus to Netolice. Obviously the bus station is on the second floor of the shopping centre… [hard to believe, but true. It seems to work well enough though I wonder how the buses get on if it snows]. 810 572 took us from Netolice to Zliv where we crossed the layout to finish up in what seemed to be a dedicated platform on the north side. On to ČB in an 834 (or its trailer in fact) on a Most-ČB working. 340 049 had charge of 3 coaches on 1209 to Linz which currently (1223) is awaiting the connection from Plzeň. Eventually left around 20 late and remained so for a fairly tedious run down to Summerau. 40 minutes at Summerau seemed like a potential punishment, but blessedly there’s a pub there and we were able to sample the products of the Freistadt brewery. Not particularly enthralling, but any port in a storm. [And the pub was both immaculate and friendly]. Back to ČD-land then in a nice comfortable Austrian coach with 340 049 in charge again. 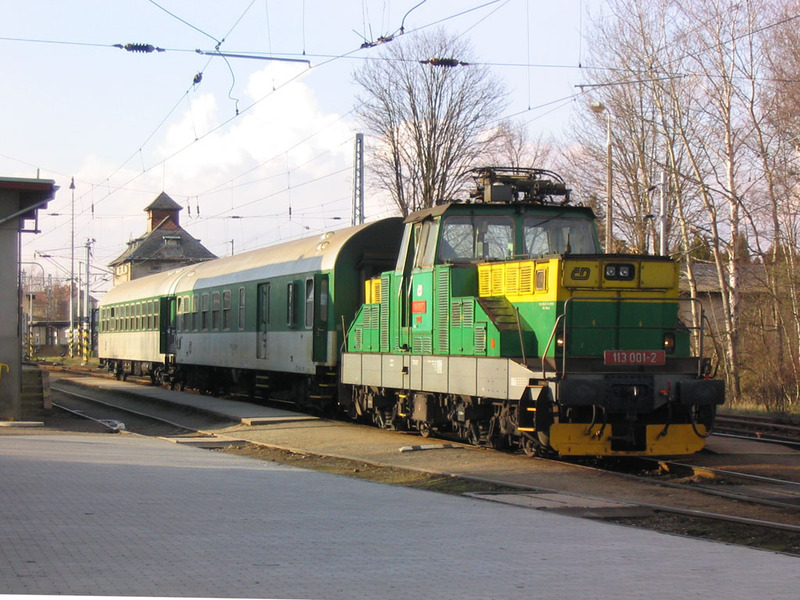 We alighted at Horni Dvoříště where Budvar was taken pending the arrival of the 210-powered connection to Lipno nad Vltavou (210 037). This started with a double decker and a single decker – lost the latter somewhere en route. Rain was falling big time at Lipno (the branch is surprisingly industrial in the upper reaches) but a couple of phots were managed for record purposes. Back at Rybník the EC from Lubljana was (only) ‘fier und zwanzig’ minutes late arriving with its Austrian loco and assorted smart coaches. The decision not to take the 1828 local proved a good one as it was held in one of the loops to let us past. Goulash and dumplings (superb) rounded off the day on the way back to ČB. A very disturbed night (noisy neighbours, noisy persons in street, deliveries etc.) but at least it’s a fine sunny morning at 0648! Breakfast materialised OK, if a little late, and I was at the station by 0750 for 0802 to Plzeň, top and tailed by 242s (207 leading). Out to Čičenice for 810393 on the 0845 to Volary which pleased me greatly by crossing over the main line to stop by the station building. I piled in straight away in case of subsequent manoeuvres, though reasonably enough there weren’t any! 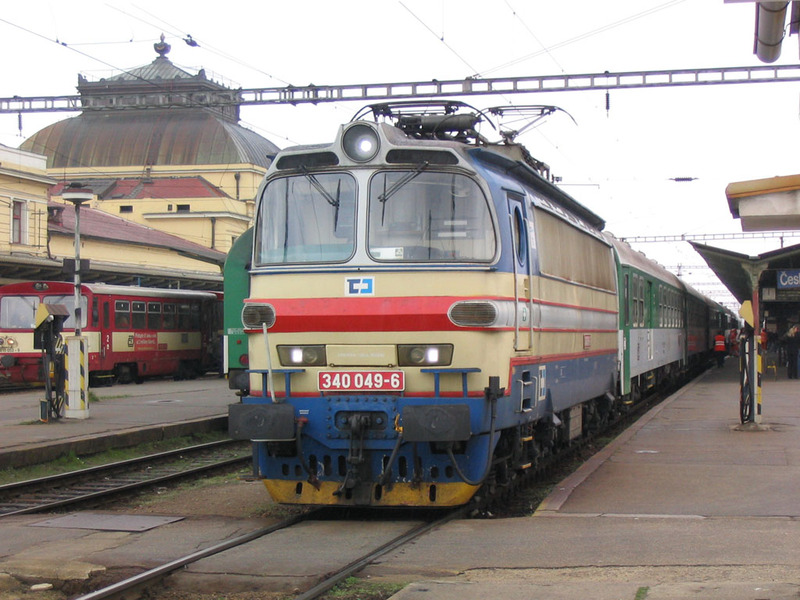 The Týn nad Vltavou branch looks a lost cause as it appears to use a separate platform. It’s a long run to Volary (1hr 40) but increasingly scenic and on a fine morning, accompanied by Bach, Mozart, Wagner et al. it was pleasant enough. Better yet, the same wheelie bin worked through to Strakonice thus ensuring at least one of the two physical connections. We used the second track across – will have to see what Monday brings. Quite snowy still in the upper reaches on the way to Vimperk, with Kubova Huť [the highest ČD station at 995m or 3264 ft] seemingly a ski resort [it is]. The train emptied there, all but 3, though obviously not for skiing purposes in April! There was serious downhill from Kubova Huť onwards, with a break at Vimperk for 8 minutes, during which a foraging party managed to obtain Grafenwalder Premium Pils from the bothy outside, and take some photos. Strakonice has a buffet, but sadly doesn’t sell the local brew [the stand-up next to the station does, but we didn’t see it] so we had to settle for a Gambrinus. Should have mentioned that the 810 on its way in from Volary went across the layout and stopped in front of the buffet door. Very decent gesture, we felt! The 810 for Blatná left from the next track, one north of the main line, and didn’t touch the main line before diverging. You can’t win them all, and 810 393 did a very good job for us! Strakonice to Blatná isn’t the most inspiring line, though it does improve. 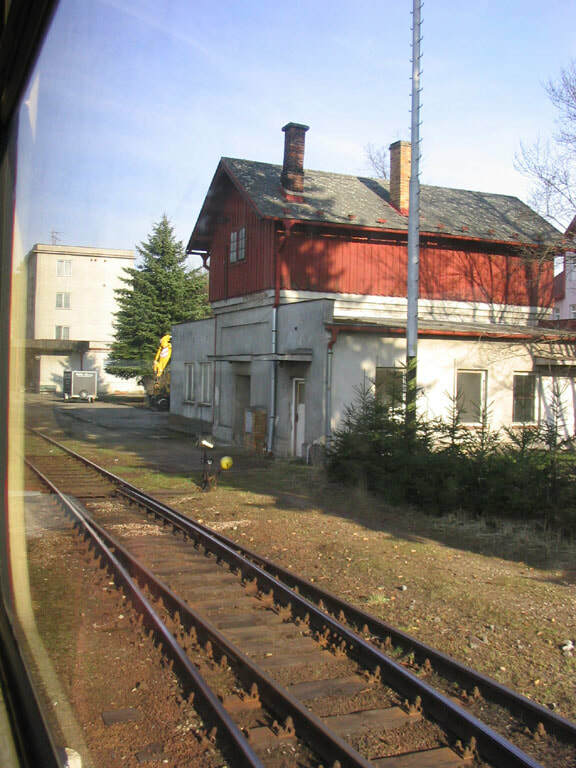 We arrived at Blatná on track 3 (from the station building), departed to Březnice from track 2. In the interim we visited the pub across the road which though heavily advertising Nektar (Strakonice) only sold Staropramen. No problem at Březnice as the Rožmitál branch diverges quite a way up the main line towards Zdice. Rožmitál is a fairly traditional (i.e. semi derelict) ČD branch terminus – but with only two more to go it seemed quite nostalgic! The Blatná trains use a dedicated bay on the west side at Březnice so no hope there unfortunately. Back at Blatná we arrived on track 4; the same bin worked through to Nepomuk so at least half the job got done there. No such luck at Nepomuk though. Another poor night, woken by commotion outside at 0330 and very uncomfortable thereafter [it was very uncomfortable all the time but I was so tired in the evenings that I managed to fall asleep fairly easily at first]. It made for a rather reluctant response to the 0500 alarm. Plenty of time for a shave and a shower [difficult as the shower fitting was broken and the shower head leaked sideways!] and a stroll to the station where I found 0602 Plzeň with only one loco (242 206), which seems a good sign [top and tail 242s as per yesterday would have suggested the diversion from Protivín to Putim (reverse) and Ražice instead of doing the main line]. And it was – straight through from Protivín to Ražice and on to Plzeň, filling in the gap from Protivín to Nezvěstice on line 190. Stuck for 3 hours at Plzeň so I got some breakfast, went for a walk, decided to get 0908 (ex Nürnberg) to Rokycany and 0935 (if possible) back, alternatively 1031 which is my planned train to Domažlice. 0908 was a bit late arriving behind Goggle 754 058 which was changed for an electric and several more coaches. The first class was German ex-IR stock, now red and white and downgraded to Regio status. Inside it’s in its original state and after nearly 20 years it’s a disgrace. Left Plzeň 6 late, but on time at Rokycany so no problem joining 363 077 on 0935 ‘R’ to Františkovy Lázně which was also on time. The first class was certainly no worse than the DB Regio stock, and arguably better. When I got back 754 058 had reappeared ready to go forward with 1100 to München Hbf which appeared on time at 1050 behind 363 127. The air con ČD compartment 1st was much superior to the tatty German stock on the Nürnberg train. It stayed there for quite a while awaiting the 1228 arrival from Plzeň which was 20+ late. I’d have been climbing the walls… Duly across the layout though. Connection at Klatovy is 26 mins but I dare say they’ll hold it and if not, it’s something to do on Tuesday morning. Didn’t need to, as the Domažlice train regained some time but it did wait a minute or 3 for the Praha – Bayerisch Eisenstein one. After the comparative (they are dreadfully noisy) luxury of the 814 we got an 810 and trailer to Horažďovice Předměstí, a journey which I found fairly tedious compared to the shorter and more scenic Domažlice-Klatovy stretch. Onwards on a 242-hauled local to Strakonice where after a longish walk to locate pubs selling Nektar, I found there was a stand-up by the station which sold it. I wish I had a euro for every time that’s happened. Rendezvous with PR off the 1620 for a Nektar and then a Gambo in the station buff so that we could get warm. That was the excuse, anyway. …but it was all made up, the Salzburg kipper was waiting, and we arrived back at České Budějovice on time, running in via the northern of the two routes past the carriage sidings. That rounded the day off nicely. Raining vigorously when I got up. No staff again at 0700; wandered in around 0710. Snowing vigorously by the time I left at 0745, causing a little concern with a scheduled bustitution not far short of line 194’s 2500 ft summit. The weather eased off though, the bustitution took a clear main road, and for the icing on the cake it followed a snowplough! Nové Údolí is a real border outpost, with a small museum and a draisine operation on a short stretch of line into Germany. 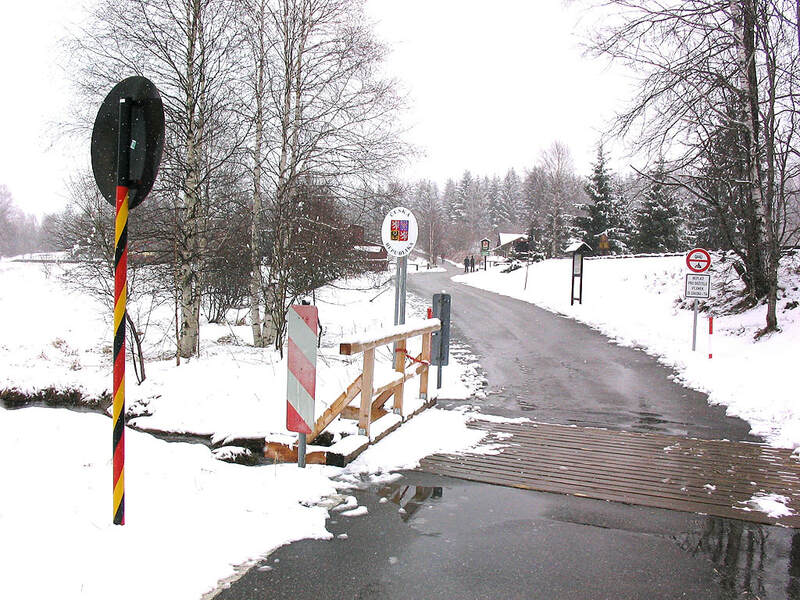 I walked into Germany and back to notch up another border foot crossing! We repaired to the ‘Travel Free’ shack where Germans (and thirsty Brits) can come to be ripped off with Pilsner Urquell at CZK28 per can. I’m certain you can get Czech beer cheaper in German supermarkets – and Berlin garages (see 28.3.04). However, once again any port in a storm. Back to Volary (so at least half the job got done at Černý Kříž where we went through on a different track again) but arrived there on the third track across and left from the fourth. Got overlap though. Volary to Čičenice was dead track, delayed 5 minutes or so by a southbound service which had presumably had to wait for a main line train. And so to Týn na Vltavou, the very last of a long list of Czech branches. ČD thoughtfully provided a vinyl seated 810 226 to mark the occasion, though slipped up slightly as it had replacement vinyl flooring with co-ordinated (with the floor, not the dark red seats) buff coloured waste bins. Idiosyncratic to the end. The occasion clearly had to be marked, so after a team photo with wheelie bin and station name board we repaired across the river to a friendly Platan establishment which hospitably opened just as we arrived. What more could one ask. Well, perhaps a shorter walk in sleet and biting wind! Despite my pessimism we did get (sort of) the physical connection at Čičenice as we joined the line used by the incoming Volary trains immediately before diverging into the Týn platform. So the track was contiguous, if a little convoluted! Back to České Budějovice on an ‘R’ with the usual bedraggled first, then a quick search on an Internet terminal at the station which turned up the Hotel Filip very near by, so I went and booked in there for Tuesday night. Thence to the Platan pub in Žižkova for a restorative while PR visited the stamp shop. Excellent meal to finish the day (pork & bacon) in a Staropramen establishment presumably priced in inverse proportion to its distance from the main square. This last looked particularly fine on the way back to the hotel in the last of the daylight. 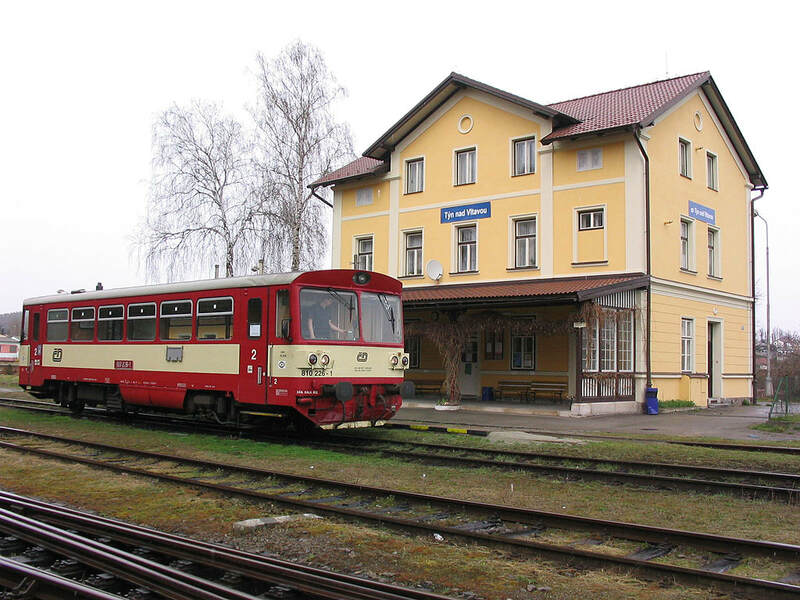 The terminus at Nové Údolí is only a few yards from the Czech/German border crossing. 810 393 can just be seen lurking in the trees beyond the German border sign. 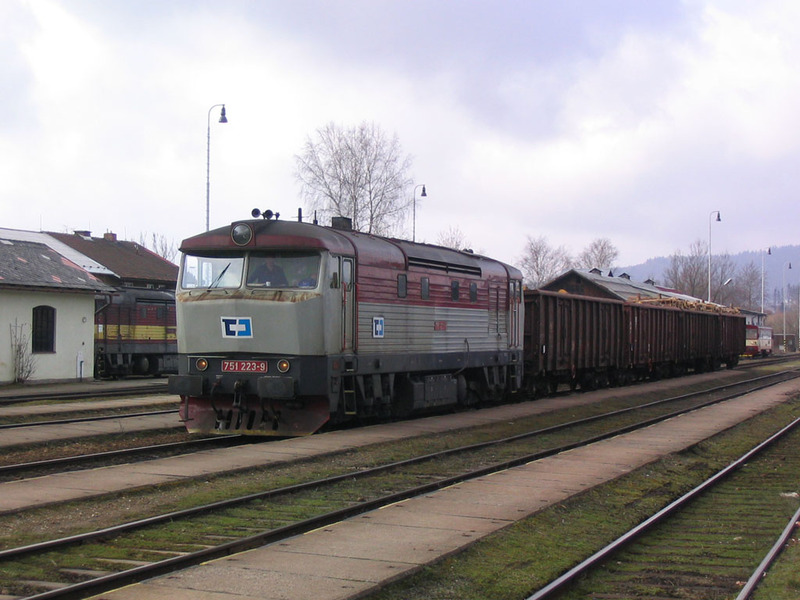 My last dead end branch on ČD was that from Čičenice to Týn na Vltavou, where 810 226 is seen on the afternoon of 7.4.08, after arrival as Os 18228 from Čičenice. I was able to finish my ČD passenger track on Os 8112, 1606 Volary-České Budějovice and this picture was taken from 810 522 as it covered the last few metres into Kájov. Mission accomplished! Excellent takeaway breakfast from the Hotel Filip at 0645 as promised. An entirely commendable establishment. 363 126 was on 0701 to Praha hl.n., which went out via the east/north side of the carriage sidings. There seems to be no rhyme nor reason to it – yesterday’s Plzeň – Brno went the other way. Stock was old style but mercifully the first class had reupholstered seats. Horrendous moleworks all the way, particularly between Benešov and the outskirts of Praha, with a near-10 minute delay at Čerčany awaiting an oncoming 451. Graffiti’d, obviously. In the circs, 10 late at Praha hl.n. was reasonable and not flight-threatening by any means. In fact there was time for a circuitous trip by Metro and on foot to Pivovarský Dům, which opens at 11. Also time to sample their wondrous light beer, it being possibly my last visit. Off to the airport then, tram 16 to I.P.Pavlova then Metro C/A and 119, as ever. BMIb did me proud again, with a punctual arrival at BHX allowing me time (even with bus to terminal) to get to Birmingham Irrational in time for the 1518 to New Street. Had it been on time, which of course in Brown’s Britain it wasn’t. Just as bad as Blair’s was. But it was a nice, smart, clean quiet Desiro. Another nice smart clean quiet Desiro did the next leg to Wolvo (1551 New Street – Liverpool) and the final rail leg was an ex CT 170 on 1557 New Street – Shrewsbury to Shifnal for a lift with H.
Thus ended another saga, 15 years this time stretching from that first ‘out and back’ on an EC from Berlin in 1993 to 810 522 on the ‘cleared just in time’ line 194. I didn’t note it at the time but when the bus left Kajov on the way out to Hořice they were still working on the track with the line blocked by a loco and wagons. There are still a couple of PSUL curves to do, and one or two threatened re-openings, but for the moment I’ll probably move on elsewhere before I get too old to bother! [Only 'for the moment' though - I've been back several times since]. A reader less nerdy than me might think I'd have a rest - or at least, not go back to Germany or the Czech Republic. But no, Mercia Charters organised a railtour which, inter alia, was to cover a line which I'd missed in passenger days. So 9 days later it was back to Germany.